Dr. Erik is a Phi Beta Kappa graduate of the University of Pittsburgh, and an honors graduate of the University of Pittsburgh School of Dental Medicine. Following dental school he completed a General Practice Residency with the VA Health System in Pittsburgh. 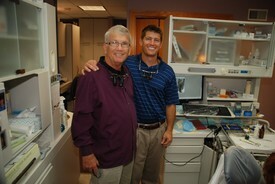 Dr. Erik has been in private practice for more than 20 years. He is a member of the Academy of General Dentistry and has completed numerous post graduate courses that have enabled the practice to remain current with the latest techniques in dentistry. He has been named one of Pittsburgh's top dentists by Pittsburgh Magazine in both 2017 and 2018. Dr. Erik lives in Peters Township with his wife and three children. Dr. Jeff is a graduate of the University Of Pittsburgh School Of Dental Medicine and has been in practice for over 35 years. Following graduation he served as a Captain in the US Army Dental Corps, both over seas and in the states. He is a member of the American Dental Association, Pennsylvania Dental Association and Washington Greene Dental Association, of which he is a past President. He is also a member of the Academy of General Dentistry. Dr. Jeff lives in Peters Township with his wife. He especially enjoys hanging out with his grandkids in his spare time.